This past weekend (June-16) I participated in the Chinook Half Triathlon in Calgary. This is the second time that I did this race (see here for Race Report 2010) and it's really fun and well organized. The highlight for me was definitely the beautiful run through the Fish Creek Provincial Park one of the largest urban parks in North America. On top of all that my parents were also here for the first time since I am in Canada and we had a wonderful time. We woke up at about 4:45am with a lot of time to slowly get up, have a breakfast and drive to the race venue. The race started at 8am, transition opened at 7am and we were at the parking lot at about 6:40am. Everything went smoothly. The swim was a 2 by 1km loop in Lake Midnapore with a quick run around a buoy on the beach. The water wasn't as cold as two years ago but still only 16 °C. I was really looking forward to the swim since I spent so much time in the pool during the last 2 years. At the end though my time this year was not faster than it was 2 years ago (32:56 vs. 32:36), although I felt better. I was hoping to be a bit faster of course, but that's what it was. The only thing that was bugging me was that I forgot how constricting it is to swim in a wetsuit, or rather in my wetsuit (Entry level Nineteen - Pipeline). My arm recovery felt way more difficult than without. It was also the first time since almost 2 years that I swam in a wetsuit. Maybe that was the problem... Since I am usually training without a wetsuit, I might not have trained as much those muscles required to swim well in a wetsuit. Swimming in a wetsuit looks quite different then swimming without one. But since my big race is a warm pacific ocean swim, I am not really concerned with this issue. The bike course is a 96 km quite scenic out and back heading straight into the Rocky Mountains, but for my taste the road is too busy to give it 5 stars. The turn around was close by the town Bragg Creek. As I am now in the lucky situation to ride with a power meter (see my previous post), I was not looking once at the speed I was going. In fact, my selected Garmin window didn't show speed at all. I was only concerned with my watts and cadence. My goal was to just collect some power data to better adjust my training zones for the upcoming 14-week IM Hawaii preparation. 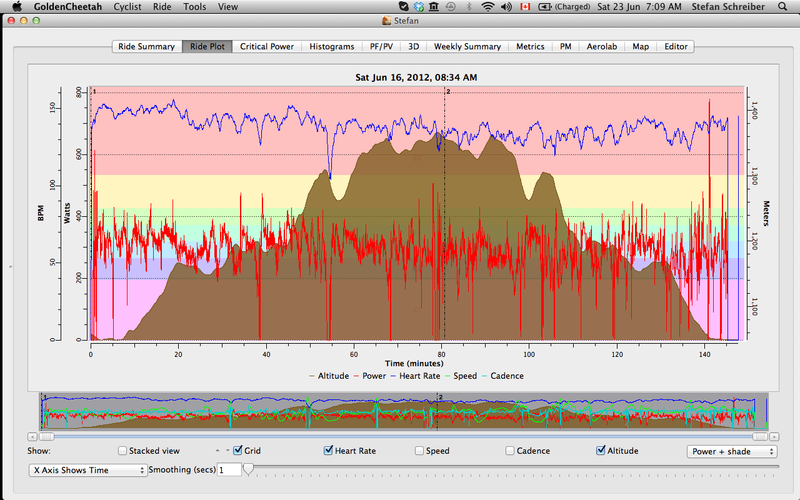 Based on my recent 5 min and 30 min all-out efforts, I was guessing to average around 300 watts. 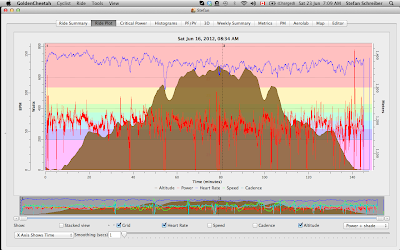 That would be racing at 85 % of my functional threshold power (FTP, 354 watts). According to "Training and Racing with a Power meter" by Allen & Coggan 2010, it is suggested to race the Half Ironman distance at about 80-85 % of FTP. On my way out I averaged 297 watts (normalized: 306; heart rate 142 bpm) and back 278 watts (normalized: 281; hear rate 134 bpm). The lower averages on the way back are mostly due to long descent back into Calgary (see figure below). Given that I was racing correctly at just below 85 % of my current FTP, I was right on with my effort. Compared with the 2010 results, I was about 3 min faster (2:28:49 vs 2:31:17). As I already mentioned above the run was really beautiful (2 laps through the Fish Creek Provincial Park). It had some up- and downhills and was not boring at all. For the first 2-3 km I had some issues with my quads (nothing unusual for me). But this time they were cramping quite badly and I was considering stopping for a few seconds to stretch them. Luckily though, as fast as they came they also disappeared. I know I am prone to cramping during the first kilometres into the run, but I forgot that they usually disappear as well. So it was good to get reminded of that for the upcoming races and not become totally devastated as soon as I feel them coming. Anyway, at that point in the race I was running in second place with quite a gap to third place. So, I didn't really had a reason to push it any harder so early in the season. I paced both my laps evenly within seconds and had an average heart rate of 146 during both laps. Compared with the 2010 results it almost exactly the same time (1:30:17 vs. 1:30:22; but my average heart rate was 153 bpm back then). But I do have to say that I felt my muscles were getting tired. I guess due to the fact that I am doing so many hard interval workouts my cardiovascular system is superb but my muscles need more distance now. And this is what comes in my next training block starting in 2 weeks. My transitions were rather slow. I took quite some time to get everything right and to not forget things. This is something that needs improvement for sure. But with two more Half Irons coming up there is also time to practice again under race conditions. Thanks to Sanja and my parents, as well as Pat (raced the Olympic distance) and Becky, and Ben and Lindsay (raced the Aquabike) for cheering and having a good time. Next Stop: The Great White North Triathlon next Sunday on July-1. An amazing weekend of road racing! !